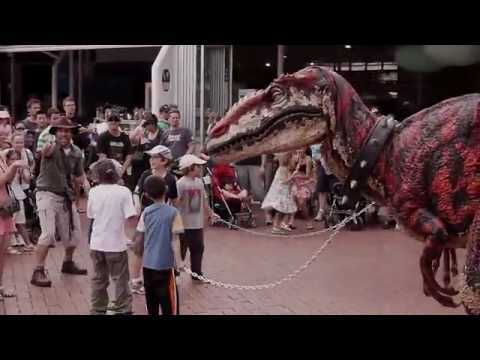 I've undertaken the project of making a realistic dinosaur costume, here's a video of the level I am trying to achieve. I get the mechanics and the frame but when it comes to how to do the skin i'm stumped. I could do a lot of the detail with foam or clay, but then to get a silicone skin the only thing I can think of is to spray or paint on silicon rubber to make a mold and then cast the mold. This just seems difficult and very expensive to do something this big. Am I missing something? The Chiodo Brothers (creators of Killer Klowns from Outer Space) have made a few of these for the Santa Barbara Zoo. They mention a proprietary silicone and spandex solution that they developed. I would imagine they have large open molds with dinosaur skin texture that they apply a layer of silicone into, and back that with a silicone impregnated spandex. You may be able to find more info by researching other implementations of this kind of character. The theatrical performance "Walking With Dinosaurs." There was also one that was performing at the Los Angeles Museum of Natural History. There are also a few companies in China that sell this kind of suit. That solution looks pretty interesting, i'll have to do some research on that. I've tried talking with some of those costume companies but as you can understand they're not talking. This is going to take some thought since I can't afford to do multiple trial and error, i've got to get it right. Thanks for the help, if anyone else has any idea's i'd be glad for any help you can offer. So I've never done a creature with a skin before, my other works all been hard shell stuff like Master Chief from halo or a dalek from doctor who, so this sounds stupid or not sturdy enough let me know. I thin layer of automotive fabric backed foam, wrapped in cheesecloth for some added texture and to help the outer skin bond to it. (or maybe that won't be necessary with a fabric backed foam?). Then make a clay negative of the scale pattern that I want and use apply liquid latex like this, (look below for link), to create a sheet of thin skin. Then apply that to the cheese cloth, and airbrush a liquid latex/paint mixture (prevent cracks in paint) for the color. Do you think that would work? I want to use silicone rubber or silicone foam but its twice as expensive. How much latex would you think I need for probably a 1/8" to a 1/4", thick? Latex would be much more economical for you compared to silicone. It should work fine, but there are a couple things to think about. Latex does not stretch as much as silicone/spandex, so you'll want more loose material at the joints. I would suggest running some test pieces to evaluate how they perform. The other concern is that latex (being a natural rubber) can degrade over time. I would see if there are any additives the rubber mask makers use to help with longevity and UV sensitivity. Normally foam latex would be used for its ability to stretch and hold its shape, but for a project this size you may want to stick with liquid latex for simplicity. I would try latex and spandex over L200 foam. In some places you may be able to get away with just texturing the L200, sealing it, and painting your latex right on top of it. He's both a great artist and instructor. I learned a lot watching that tutorial series. How would you recommend attaching latex to spandex? I'm a big fan of hot glue but I've never tried it on latex. I would try soaking the latex into the spandex to see if you can get them to bond mechanically. Otherwise you could use something like 3M's Super 77 spray, or possibly Barge contact adhesive. Hot glue is more of a temporary bond in most cases. By soaking the latex do you mean after I have the latex piece I want to apply done I put a wet layer of latex onto the spandex and immediately add the latex pattern onto the spandex? When you are casting the latex pieces I would try and incorporate the spandex, allowing the wet latex to soak into the material. I would do some experiments to see what kind of bond you are able to get with what ever spandex fabric you find, testing for strength and stretchability. Cameron, did you ever figure out a working solution for the skin? I'm going to be making a Godzilla 2019 suit, and I am looking to make it as realistic as possible. 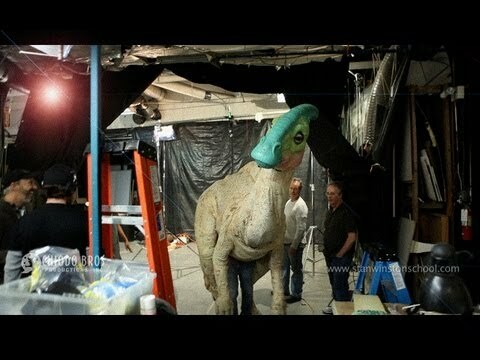 My plan is to use techniques that were used for the dinosaurs in the Walking with Dinosaurs live show. Including muscle bags, and most importantly, the realistic skin. Like you, I don't have much time to use trail and error, as I want to try and get this suit done before the premiere of Godzilla King of the Monsters.